Old doors, knitting in Starbucks, a cat water fountain and Happy Birthday Dad. Hope you don’t mind a mixed bag of all kinds of interesting things today. I’m still working on the bathroom with no real good progress shots to show yet. The bathroom reno is going well though! The paint is now down, but sadly, the window moulding is not done. Now that my gun works, I lost it! Don’t. Even. Ask. It’s here somewhere, I just don’t know where and I got tired of cleaning the house in order to find it. Another day! 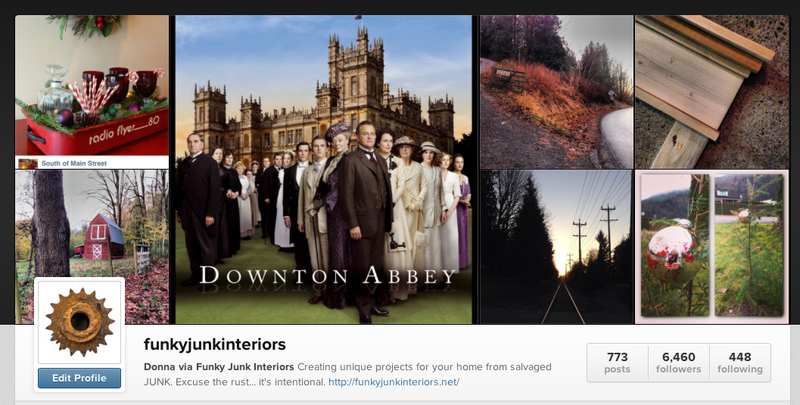 You can peek at a few shots on my Instagram account HERE. 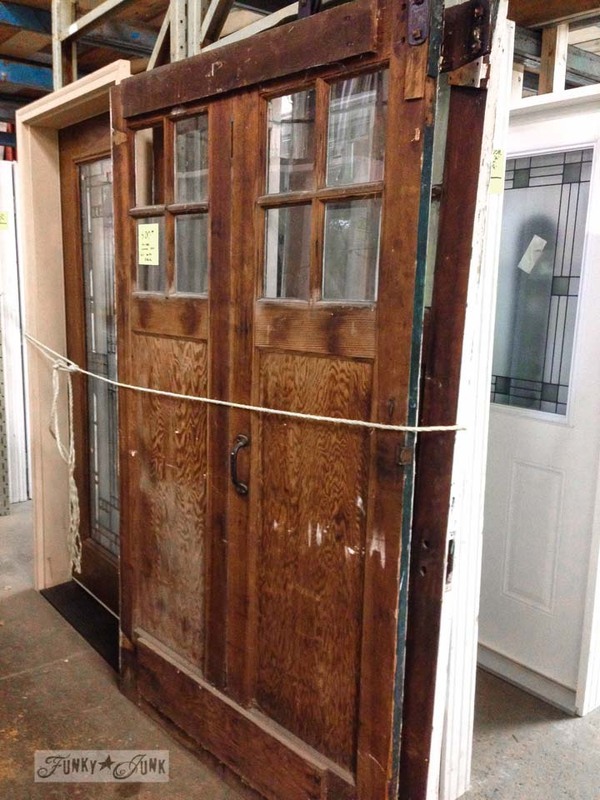 Peeking in at a salvage yard yesterday for some eye candy for the bathroom, these old doors on tracks were so tempting! But at $500 and no room for them, they’ll have to look nice behind that rope. 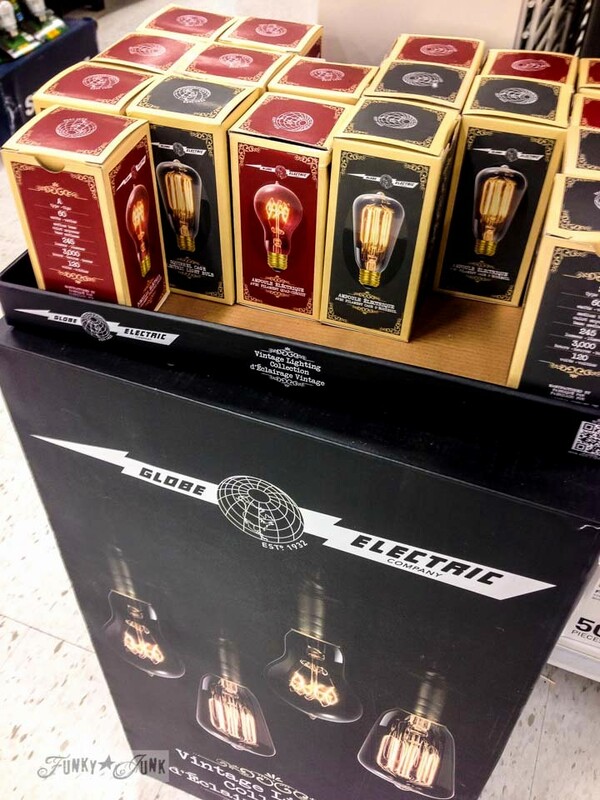 I couldn’t believe my eyes when these vintage styled lightbulbs were spotted in SuperStore (Canada). I bought two, but am not sure about them. They’re cool, but they shine very yellow. I didn’t expect that. Have you tried them? Where do you like to use them? I may take them back unless I figure out the perfect mood lighting idea where tasks aren’t necessary. At $10 a pop, they aren’t cheap. 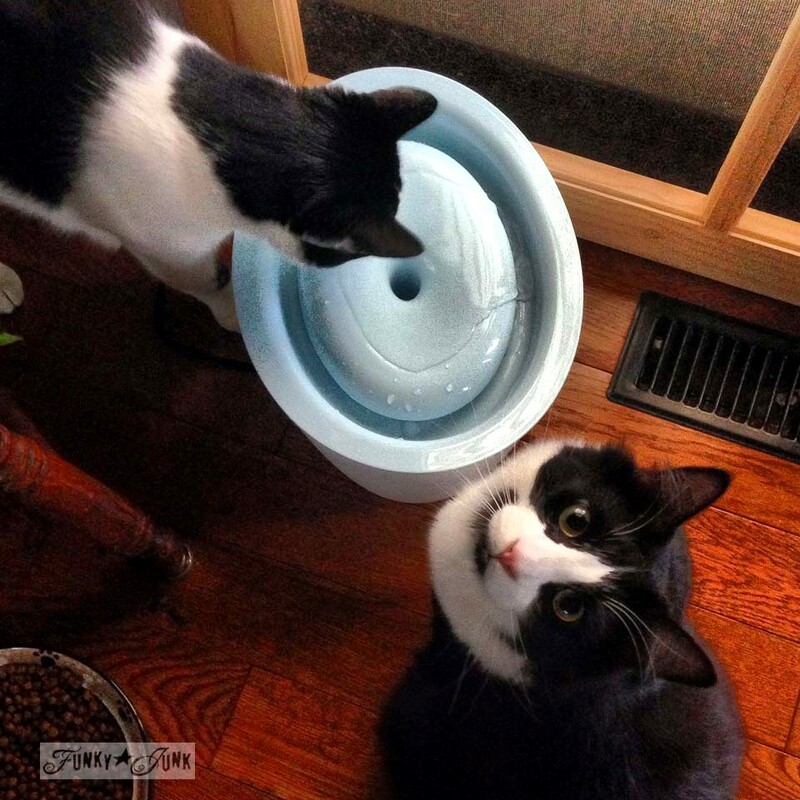 Since my cats seem to only like fresh running water, I picked up a cat water fountain for them. Not having a clue what I was doing, I thought the trickling water sounded lovely! But they wouldn’t go NEAR it. After spending $50 on the thing, I wasn’t too thrilled. I decided to try it one more time with fresh water and this time filled it VERY full. I was surprised that the trickling noise stopped and they came over nearly immediately. Seriously?! I had to stand with them the first few times but now they enjoy it. Thank goodness! They love to dunk their paws in there to test it out first, it’s pretty cute. Now this is a cute story. I was in Starbucks last night enjoying my vente cinnamon dolce latte while my boy was swimming with friends, and didn’t pay much attention to what was going on around me. I was happy with my laptop and fluffy coffee for 2.5 hours without a care in the world. But as I got up to leave, that’s when I noticed the long table behind me had filled up. Their work was so beautiful! This is sock yarn which is very thin. 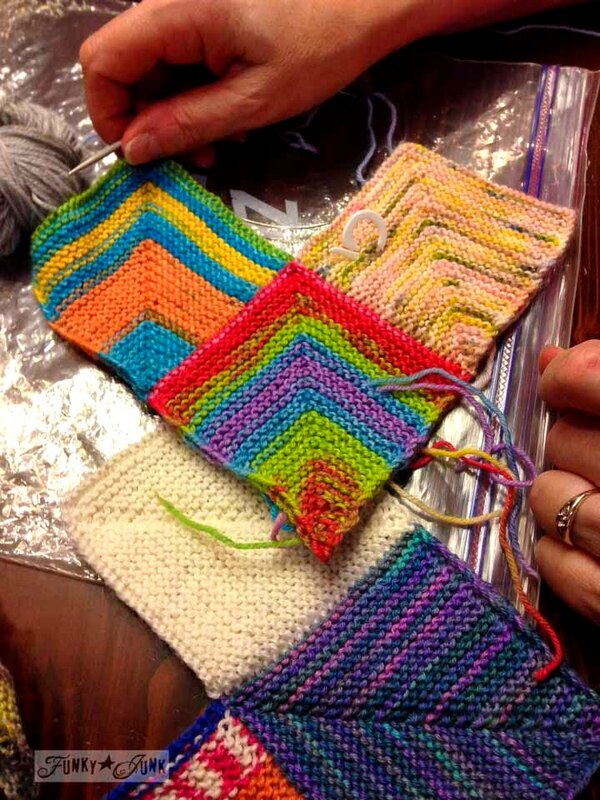 This gal saved all the leftover yarn from family projects and named what each yarn square resembled back at home. From socks, blankets, you name it. She was creating a memory quilt out of the scraps. So charming! I use to knit back in the day. I even started one of those big bulky cowichan sweaters with the grey/white/black eagle pattern. No idea what happened to it but I never remember wearing a thing I made. 🙂 But who knows… if my boy makes a habit of swimming on Monday nights, I just may take these charming gals up on their offer! Maybe I’ll finger knit. Have you seen this? Just A Girl explains how finger knitting is done HERE complete with a video clip on her blog post. It’s brilliant and so beautiful! With not a needle in sight. Well that was fun! All these photos are from my iPhone. I’ve actually been using instagram quite a bit lately so if you’re so inclined, follow me on over there HERE and check it all out! 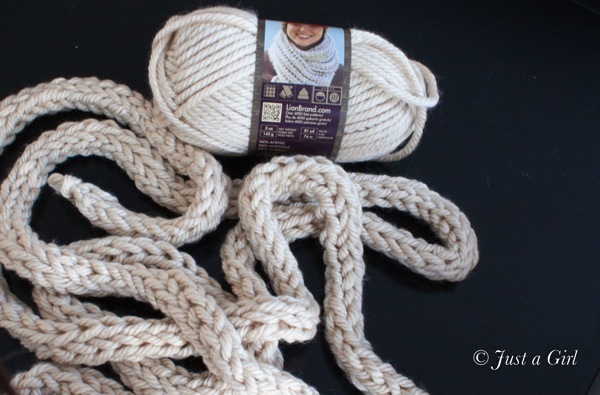 I want to try the finger knitting… I saw a great scarf that was made up of strands just like that wrapped and wrapped around your neck with a buckle…. it was great, I’ve been looking for a tutorial… thanks! I have a black and white cat who looks just like your kitty looking up in the first photo. When my beloved black cat named Ernie died, I wanted another black cat, since, as rescues, black cats are the hardest to place. Oh, and I wanted brothers. So, I got a call and a rescue had a totally black cat for me and I named him Boo. He came with a black and white brother, who I named Steve. 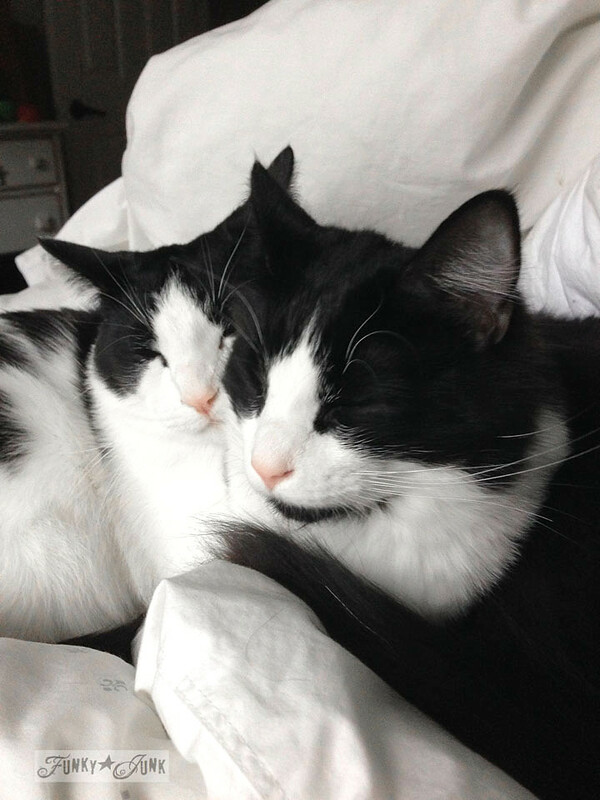 Having siblings is great, since they naturally snuggle and keep each other company. I have thought about a fountain, thanks for the information about how you got your crew to drink from yours. Isn’t it hard when you buy pets items and they aren’t interested? Your dad and I share the same birthday, so Happy Birthday to your sweet dad! He had the better place to celebrate though! I went back and looked at your video…makes me long to be on a farm! Thanks for all the great posts! 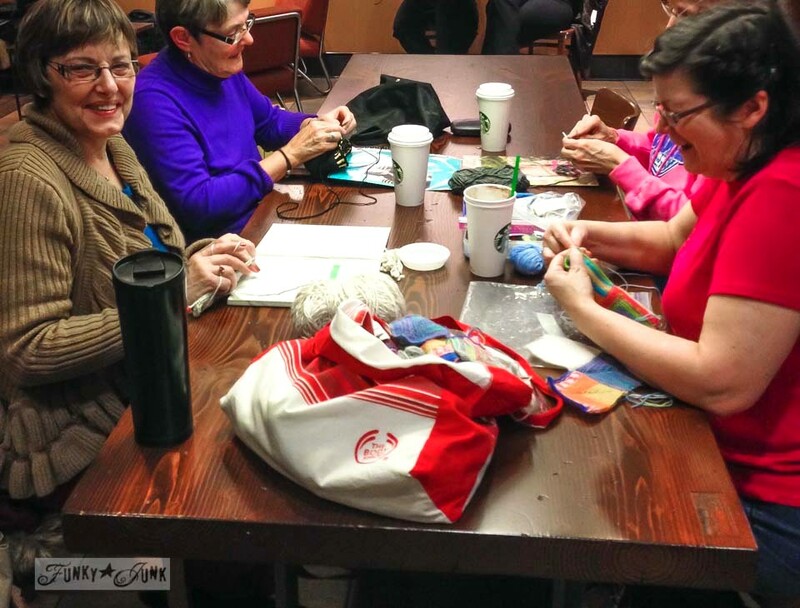 We have a weekly knitting/crocheting group in a local Panera. We meet every Thursday night and have for years. The management gets concerned when we aren’t there. Some weeks we have 3 people, sometimes we have 20. It is an open group and sometimes husbands come and sit at the end of the table and discuss their guy stuff. We never turn down anyone who wants to join in. I wish I had a set of doors like that, I have a spot, but won’t be dishing out that cash either. I was also surprised by the yellow light of those bulbs. I have mine on two lamps with exposed shades on our bedroom dresser that I rarely turn on. The yellow light is fine for ambiance in a room you are not using. That cat sleeping photo is P.D.C…… pretty darn cute! Never heard of finger knitting, so will pass that info on to one of my daughters. Won’t watch the farm video, I get weepy just when anyone says they miss their dad. I agree…. Random posts… Random comments!! Drooling over those doors….is it possible to have door fetish? I love old doors…. My black and white kitty was abandoned in a snow storm!!! We saved him and he is part of our family now…. Must try the water fountain!!! Happy happy Birthday to your Dad!!! Gone but not forgotten. Not sure if I will watch the video…. You can definitely make me cry!!!! Have a blessed day!!!! And you WILL find the nail gun when you least expect it. Kitty cat water fountains are a staple in our 2 cat household. We’re on the second one..! Both my cats had urinary tract issues and pricey Rx food wasn’t going to be in the budget, so I bought the first fountain about 5 years ago and crossed my fingers. Knock on wood they have been problem free since! If it’s not full enough, it will gurgle– and that drives my husband crazy…! 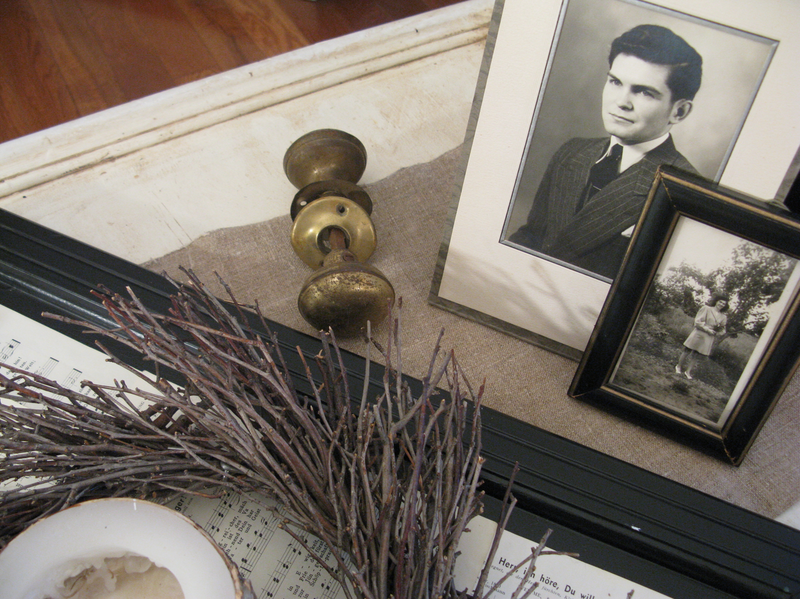 I think it’s soothing and I wrote about it here.. http://recollecteddesign.com/2014/01/09/its-all-in-how-you-frame-it/! haha! Anyway just thought I’d add to your randomness. Have a happy day! gah! you’re killing me with the knitting!! maybe we should BOTH go to a starbucks – you know only 3,500 miles apart (they have Starbucks in CANADA??!! who knew??) and get on skype – and knit together… it’s hard to eat popcorn and knit at the same time though… and they don’t like it when i show up in my pajamas…. ps. my daughter finger knits – and I used some of her finger knitting as “garland” to decorate my guest room at Christmas…. What a sweet photo of your mom and dad. I don’t know what it feels like to lose a parent. On to happier things. 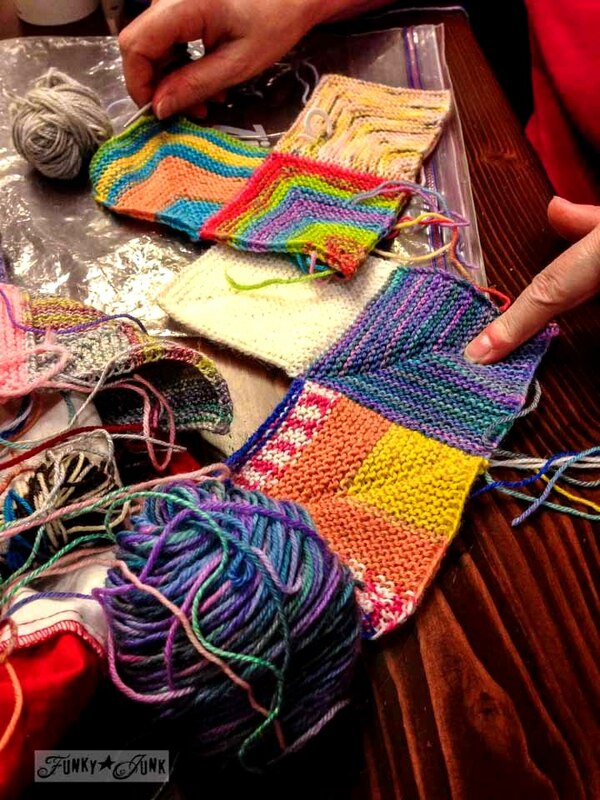 Love the bright yarn colors! I just discovered finger knitting a few months back and showed it to my 8 yr daughter. She is on a roll now! I used to knit back in school, would love to get back to it one day. Those hearts are beautiful. I love reading everything you write but I especially enjoy your cats. I also have two, both calico. The older cat, Gertie drinks water by putting her paw in the dish. The younger cat, Lucy (my hubby calls her Lucifer) just sticks her head in and laps it up. They drink out of the dog’s bowl and the dogs are so afraid of Gertie, they let her do anything she wants. Please keep writing about them. Thank you. Donna – Happy Birthday to your daddy! I’m sure he watches you from heaven and is very proud of you. You will find that nail gun in the oddest place and I am looking forward to seeing your bathroom redo. I have a few of those light bulbs, they really are nice but take some getting used to. I use them as more of accent lights, but they last a long time despite how expensive and fragile they look. I like them as reading lights when Im using my computer or tablet and I don’t want to sit in complete darkness. Those kitties are so sweet, we bought ours one of those water things a year or so ago and it took them a week or two to get used to the thing but now they wont go near any other type of water. Hopefully yours is easier to clean then ours. Your Dad surely WAS handsome! What a sweet smile . . . I lost my Mom at the same age . . 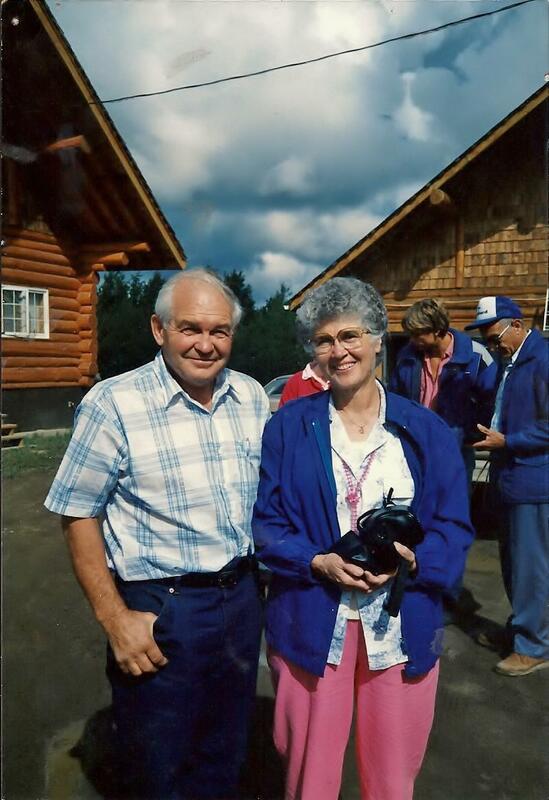 I miss her every single day – 24 years later . .
My Dad is 87 and how very lucky I am to have him still here . . . I am so sorry you lost your Dad so soon . . .